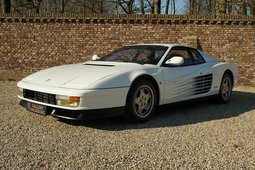 In 1984 not only one of the most distinctive Ferraris but also one of the most iconic cars from the 80s was released - the Ferrari Testarossa. Besides being bigger and wider than its predecessor the 1981 512i Berlinetta Boxer, it also gave a new tone to the term exotic-looking. No other car from the period seems to fit that description better. The Testarossa was up ahead with the bedroom poster king - the Lamborghini Countach. Both of these cars look fast even when stationary, but usually this is where the cleverness of the 80's design would stop and all of the engineering misunderstandings would begin. Many of the 80's GT cars were less of Grand Tourers and more of 'Grand torturers' for its occupants. Is it the same with this Ferrari? Let's take a look at the most eye-catching detail of this Pininfarina design - the strakes on the side intakes. Although there have been rumors that they're for grating cheese, their actual purpose is to satisfy regulations in countries that did not allow such large openings. These intakes however are essential to provide cool air to the radiators. These have been moved from the front to the back in order to avoid hot pipes wrapping around the cabin and baking its occupants. Putting the cooling system in the back also allowed for decent luggage space under the front-trunk or 'frunk' as it is now referred. There are some more interesting design cues: the engine is a flat twelve boxer which is great for keeping the centre of gravity low. Though in this Ferrari it is installed quite high up due to the fact that the gearbox is attached right underneath. Not only this doesn't seem like a good idea to improve handling, this configuration also makes access to all the accessories limited to even the tiniest of hands. The trade-off for all this – more room in the cabin. To make it even comfier for its passengers, the tires are 'chubby' 225*55 r16's. What's also 'chubby' is the fuel tank - a capacity of 115 liters will definitely help to miss a gas station or two. By now one might be thinking that there must have been a German involved in designing this car but it doesn't stop. For a relaxing drive good visibility is essential. 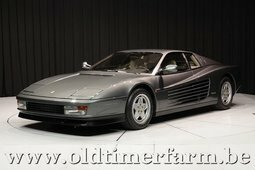 However on most supercars the rear window is useless, but in the Testarossa - not only does it provide information what's happening behind in the lower class, but it's also heated with transparent heating elements. In fact this Ferrari has good visibility all-round, which leaves more room to enjoy the 4.9l engine. Its peak torque of 490 Newton meters is relatively low at 4300 and its power peaks at 6300rpm providing 390hp. That is enough for this Ferrari to reach 60mph in 5.2s and still have plenty of low-end grunt. 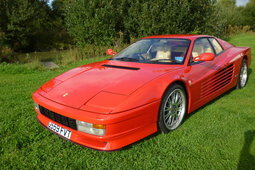 Not having power steering might also seem like low end, but in the Testarossa it's bearable and provides good feedback. 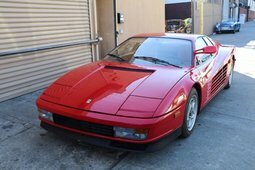 With features likes this, this is a unicorn of an 80's supercar. And back in the day this was noticed - there were so many buyers, that a waiting time of 5 years was not very unusual. 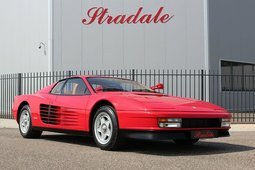 The Testarossa found its share in the market because the Countach was too vulgar and nowhere near as drivable. Jaguar's luxurious XJS did not have the speed or the prestige. Aston Martin's V8 Vantage was not a V12 leaving the Ferrari in a class of its own. 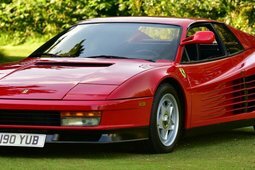 In 1991 the Testarossa got a 90s makeup and became the sportier 512TR. Three years later a limited production of the even faster F512LM began until in 1996 it was replaced by the elegant 550 Maranello. 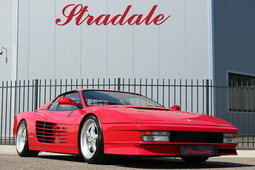 Despite the good effort from Ferrari themselves, they could not match the original Testarossa exotic zing.